If there’s one thing that I almost always have leftover after Thanksgiving, but have absolutely no idea how to use, it’s canned pumpkin. All that other food… turkey, mashed potatoes, stuffing… I can deal with it. I can make burritos and soups and it will disappear. Canned pumpkin is tricky though. I wish I could make this grilled cheese with it, but it’s a bit too watery. I usually end up just feeding it to Porter honestly. So this year I spent some time thinking about a real dish I could make with a few cups of leftover pumpkin and these Pumpkin Pie Crepes were the result! They are pretty simple to make and would be a great little brunch over the Thanksgiving weekend. 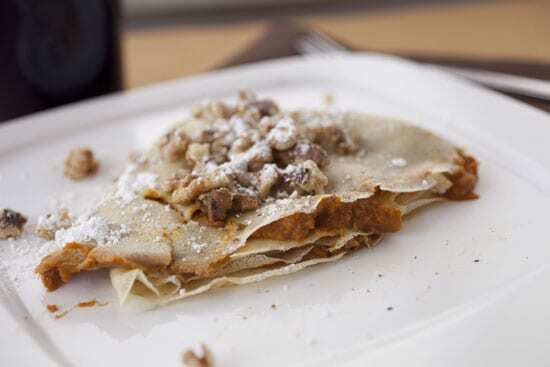 Delicious traditional crepes stuffed with a slightly sweet pumpkin pie filling. Topped with toasted walnuts for some crunch! 1) Whisk together dry ingredients in a medium bowl. In a small bowl, whisk together eggs and milk. 2) Stir wet ingredients into dry ingredients. Let batter rest for 10-15 minutes (or you can make this hours in advance), then stir in melted, but cooled, butter. 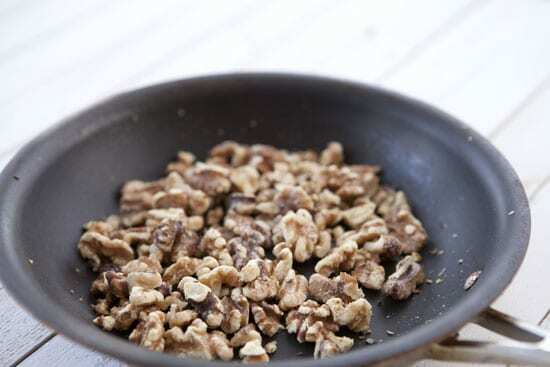 3) Toast walnuts in a dry skillet over low heat until lightly browned and fragrant. Add all ingredients to a small sauce pan and bring to a simmer over low heat. Stir until everything is combined. Keep on low heat until needed. Add about a teaspoon of butter to a large nonstick skillet over medium heat. 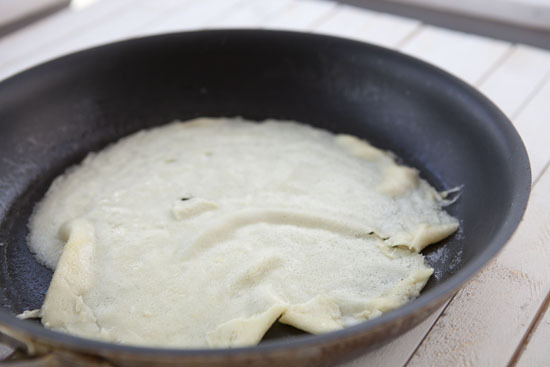 When the butter is melted, add about 1/2 cup of crepe batter to the pan and quickly swirl the pan so the batter spreads over the entire pan in a thin layer. Cook crepe for about 45-60 seconds on the first side. Then use a large spatula to carefully flip the crepe. Spread about 1/3 cup of pumpkin pie filling to the crepe and continue to cook on the second side for 90 seconds so it browns slightly. Fold the crepe over and then over again to form a triangle. 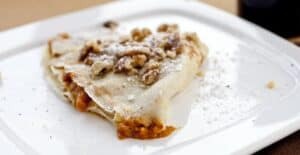 Serve crepe immediately with walnuts and powdered sugar. The hard thing about making crepes is not the batter. The batter is pretty easy actually. 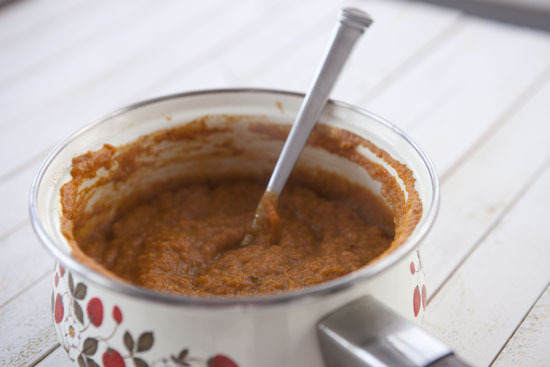 Just whisk together your dry and wet ingredients separately and then stir them together – wet into dry. Then add in your melted (but cooled) butter. 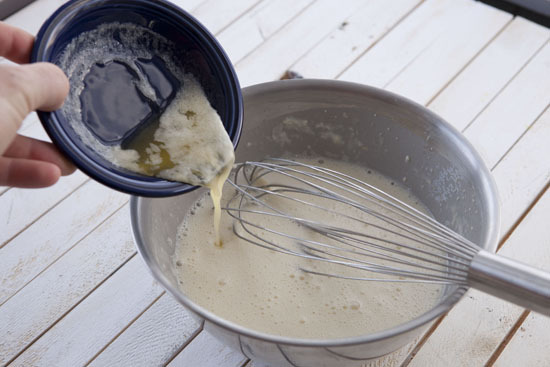 The finished batter should be pretty runny and it really needs to sit for at least 15-20 minutes before you can use it so the flour hydrates correctly. While you’re letting your batter rest, you can make the filling. This filling is far from rocket science. It’s very similar to a pumpkin pie filling but without the egg and stuff that would normally make it firm up in pie form. Add the pumpkin to a small pot along with the other ingredients and heat it over low heat until everything comes together. The final mixture will be thick and smell delicious. Feel free to adjust the flavors to your liking. The first time I made this, Betsy and I both agreed the filling was a bit bland so I upped the spice levels. Definitely taste it and feel free to add more sugar or spices if that’s your thing. It’s far from a hard and fast ratio. Keep this warm until needed. My first tip when trying to teach people to make crepes is always to plan for failure. This crepe batter recipe makes six crepes if you nail all of them. You will probably screw up two though so you’ll get four good ones. This is, of course, unless you are an expert crepe maker. To this day, I always screw up at least the first one. This one tore around the edges and had a big fat hole in the center. Is it edible? Sure. But it’s not great. My second one turned out much better. 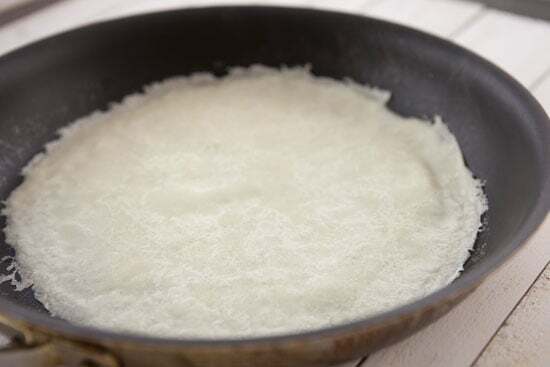 To make a good one, add a small amount of butter (1 teaspoonish) to a large nonstick skillet over medium heat. 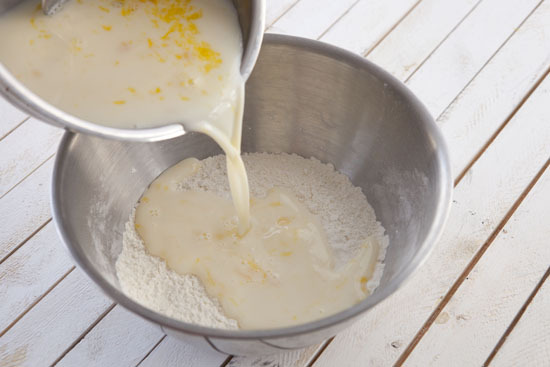 Once the butter is melted and spread over the pan, pour in 1/2 cup of batter and immediately swirld it around the pan so it spreads all the way to the edges. Cook it for about 45-60 seconds on the first side and carefully flip it with a large spatula. The flip is usually where it goes wrong, but you should be able to get it after a few tries. If it’s your first time trying crepes… maybe double the batter recipe so you have plenty of wiggle room. 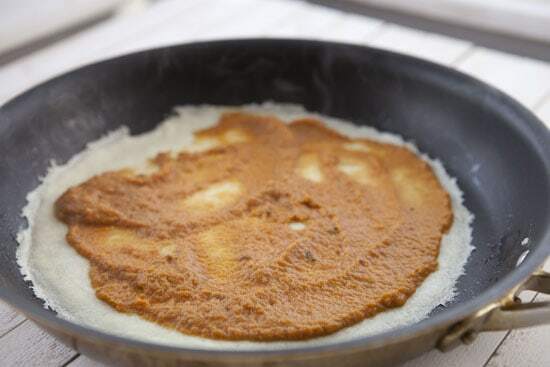 Once your crepe is flipped, spread on about 1/3 cup of the pumpkin filling and let the crepe continue to cook for another 1-2 minutes so the crepe gets lightly browned on the bottom. Also, toast some walnuts. You could also use pecans for this but some sort of toasted nut is very important in my opinion because it gives some texture to the crepes. Just toast them in a dry skillet over low heat until they are fragrant, about 4-5 minutes. Once your crepe is done, I like to make a triangle out of it. To do this, fold it in half and then in half again to make a wedge. This creates a bunch of layers of crepe and pumpkin. Top with nuts and powdered sugar (or whipped cream) and eat it immediately! Every time I make crepes, I always remind myself that I wished I made them more because they actually are as easy, if not easier, than pancakes in my opinion once you get the hang of them. And they are easier to stuff and fill. People are, for some reason, super impressed by them also so they are a great brunch treat! If you find yourself with a leftover can of pumpkin on this upcoming weekend, give these Pumpkin Pie Crepes a shot! Pumpkin comes in a can? Honestly, I don’t know who you are. I read all these great culinary tips and delicious recipes and then you use ‘can of pumpkin’ in a sentence and I cringe. Pumpkin is a winter squash that is just about interchangeable with any other winter squash. Cut it in half and roast it. Then serve it with salt and butter. Haha. Yes… I realize that pumpkin is a winter squash that you can roast. 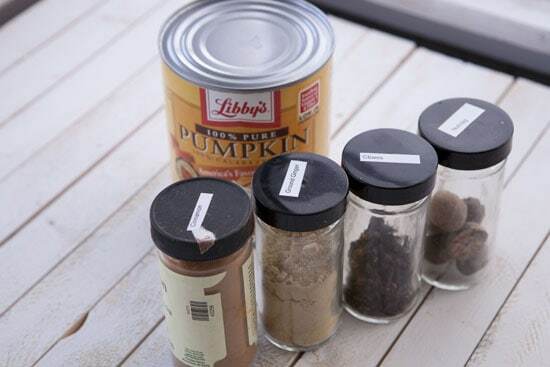 I like doing that also, but during the holidays canned pumpkin is pretty popular so I just thought I would give people some ideas. Of course, you could use roasted, mashed pumpkin for these crepes like I did with my pumpkin grilled cheese. I make pumpkin wontons with leftover canned pumpkin. super easy. Make pumpkin filling (usually canned pumpkin, spices, a few tsps of maple syrup (or sugar of choice) then spoon a bit into a wonton square wrapper. pinch it into a triangle, dust with cinnamon sugar and bake until golden. so delicious, so easy! or else I just throw some canned pumpkin into my breakfast smoothie (adds fiber). You know…I was thinking about making a non-pumpkin pie something this year! Thanks! That pot you used is just like the ones my mom gave me in my first apartment :) I miss them! This is a great idea. I was thinking about making crepes this week, but I felt that the berries I usually use weren’t really seasonal-feeling. I keep canned pumpkin (or gasp! pumpkin pie mix!) on hand for when I have extra fresh ginger which I know I will be too busy to use up. 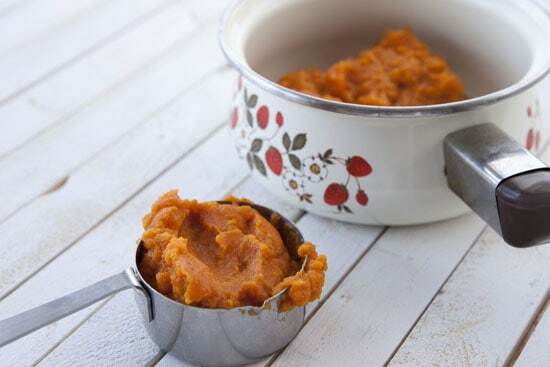 I oil a half-dozen muffin tin, throw about a tablespoon of chopped ginger in each cup, and then spoon the contents of a small can of pumpkin puree on top. Freeze, put in a baggie, and it’s a smoothie when you add a banana, milk, maple syrup, spices and some yogurt to it in a blender. Also, pumpkin soup with leftover canned stuff is fantastic! And, just as I’ll use canned tomatoes when my home canned stuff runs out, I’m more than willing to buy canned squashes when my storage is empty. As long as it’s 100% squash, and not the pumpkin pie filling, it’s so useful! what are you talking about? Pumpkin bread is the shiznit. The. Shiz. Nit. Topped with roasted pumpkin seeds? omg. to die. to die. I never had thought pumpkin in a crepe but it still seems delicious!!! Yammie yammie!!! 1: Cook it down. Slow cooker preferably. Just put a whole ton of fresh pumpkin that’s already been roasted and processed into the slow cooker and leave it for several hours. It’ll get a better texture. 2: Mix it with equal parts peanut butter. The PB will be borderline dominant in terms of flavor, but the texture comes out rich and thick. Almost like a peanut butter cup. I drop dollops of these in my pancakes as they’re on the griddle.